Should I have subtitled this, “Includes a UNICORN crust?” I don’t understand the obsession with unicorns. I mean, Lisa Frank was cool and all, but I guess I just bash things that seem too trendy to believe. Examples include fidget spinners (my boys at school love them), this unicorn/mermaid/ glorified rainbow guise, and Pokemon Go (crazed coworkers). They’re fun while they last, but when things are cool for a month, I feel like I’m about to get on board as soon as they’re fading. I think this is called being late to the party. Maybe I’m just a grandma, but I like to be able to count on my items being fashionable, wearable, and usable for awhile. That’s part of adulting, right? Spending your money based on and item’s quality rather than its “on trend” factor? The good news is that pie is always trending because it’s CLASSIC. (See what I did there?) Strawberries are classic. Lattice crust is class. Pie is classic. Nothing going out of style. We’re good, keeping everything under control. BUT… because I can’t leave anything alone, I threw some rainbow sprinkles into the crust for good measure. 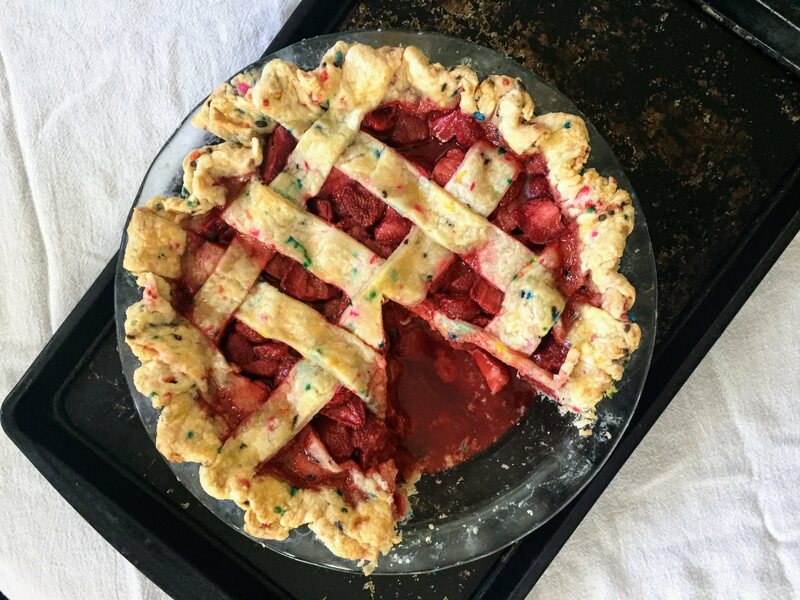 Inspired by this little number over at Studio DIY, I took the idea and ran with it, making a baked strawberry pie (somewhat of a rarity!) with a rainbow dusted crust. 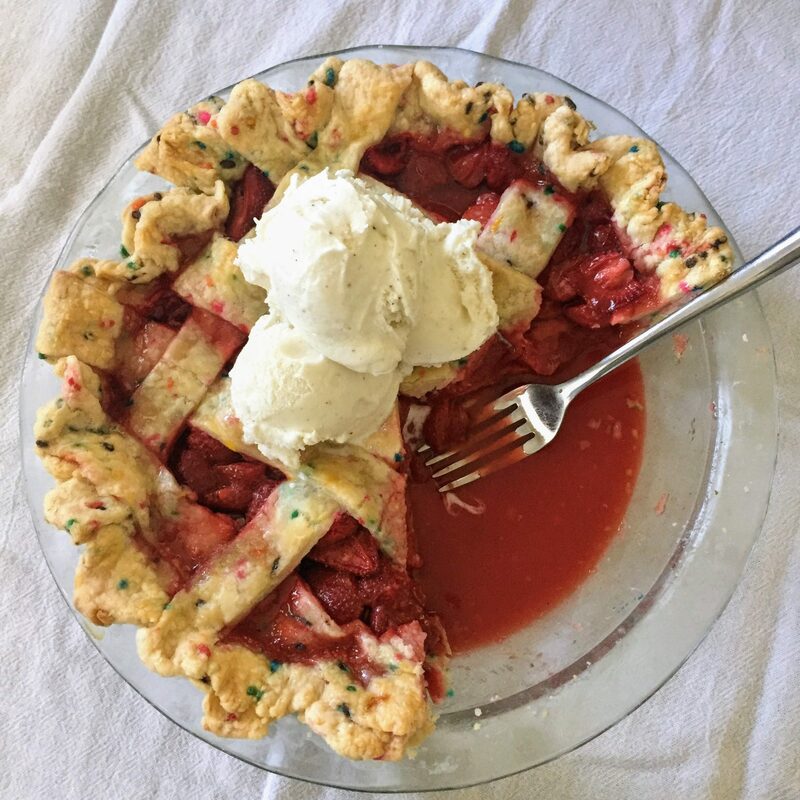 I will warn you: if you eat this pie warm or at room temperature, you will get a side of strawberry juice with your pie. There’s a reason not a ton of baked strawberry pies exist, and it’s because they’re juicy as you know what. But, if you like your pie juice, then, like me, you will love this pie! If you want a thicker, less syrupy filling and have the patience for it, let your pie cool and then refrigerate it overnight. Nevermind that when your pie is chilled, it’s 6:45 AM. Pie for breakfast? Solid life choice. You might notice the attempt at crimping my pie crust; obviously this isn’t my strong suit. Yet. I’m working on my pie skills, but I will have you know that I used Sally’s recipe for crust and this tutorial for the crimping. Why fix what ain’t broken, ya know? Anyway, I hope it’s not too late for you to find strawberries and that you can make this pie. My husband, who is a self-proclaimed “I care about 100x less about that dessert if it doesn’t involve chocolate” kinda dude said, “This is REALLY good” multiple times. So, you’ve got nothing to lose. Roll up your sleeves, bust out that rolling pin (ahem empty wine bottle), and get to pie! I promise it’ll taste like unicorns and rainbows. 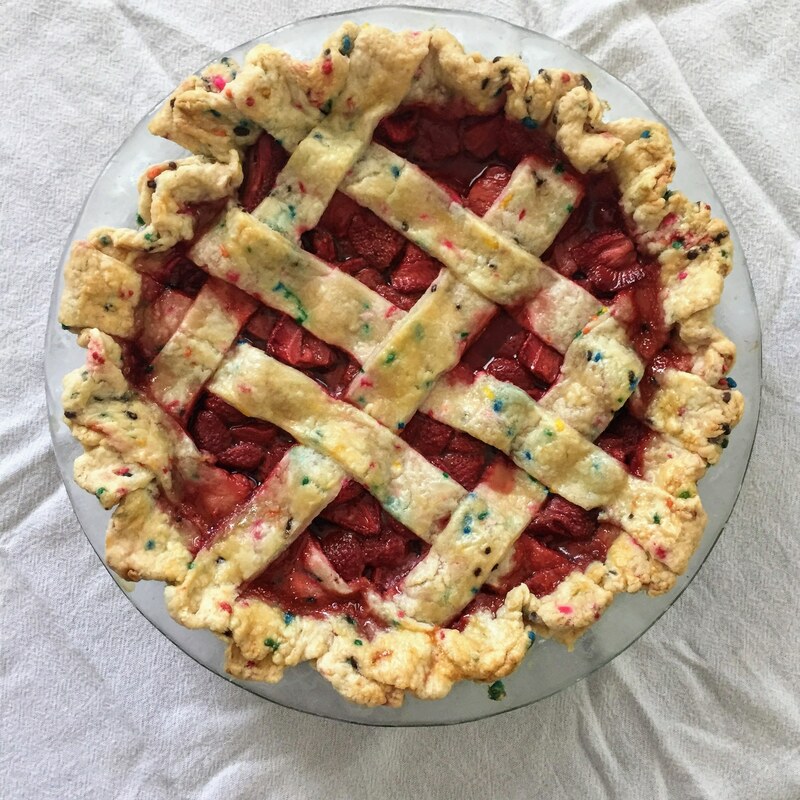 A baked strawberry pie with a rainbow sprinkle embedded crust! Cut the butter and lard into the flour mixture using a pastry blender or nut chopped. Continue until the pieces of butter and lard are about the size of peas. Knead the sprinkles into the pie dough. Allow to cool completely before slicing and serving. To keep the pie's juices from running when you slice it, allow it to refrigerate for at least 3 hours after it has cooled. Combine all of the filling ingredients in a bowl and stir until JUST combined. Do not overmix. Once the dough has chilled, roll one of the balls out on a floured surface until it is about 1.5 times the size of the pie plate. Flip the rolled dough into the pie plate and pour the filling into the crust. Roll out the second disk of dough until it is about 1.5 times the size of the pie plate. If you want to make a lattice crust, use a pizza cutter or knife to cut the dough into even strips (mine were about 1 inch think). Weave the strips over the pie filling. Pour the filling mixture into the pie crust, or to decrease the amount of juice in the pie, spoon the filling into the pie crust and discard the juices. Seal the edges of the pie crust by folding over any extra dough and pinching it together. To crimp the pie crust, make a C shape with your index finger and thumb and hold it against the inside of the edges of the crust. Push the index finger on your opposite hand between the C shape to make a wavy edge. Bake the pie at 400 degrees for 20 minutes. Turn the oven temperature to 350 degrees and bake for 35-40 more minutes, until the crust is golden brown and the filling is bubbling. Allow to cool completely before cutting and serving. Leftovers will stay fresh in the fridge for up to a week. This pie was incredible. Thanks, babe!